My buddy Libby has reached the final of the Musicroom Acoustic Showcase in Portsmouth, and she told me she was planning to sell a little EP at her performance. So I made her this sleeve to pop in the cases, to set it off a bit. I figure her music is smooth like a good year beer, and suprisingly musky and oaky with a characteristic aged quality within its modern setting. Plus she's always come over a little swashbuckling, with her growls and hats. I made a little bottle label for each track on the back, to showcase each song's own 'flava'. Pick a copy up at The Wedgewood Rooms in Portsmouth on 28th July. Good luck kiddo. 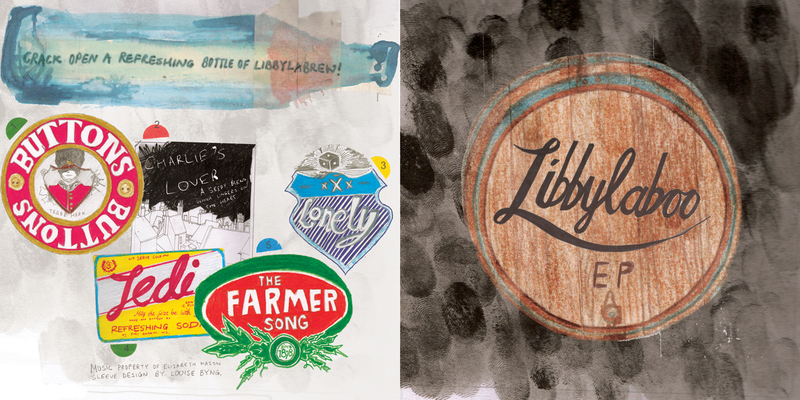 And let enough beer flow to sail the HMS Libby + crew, abob! 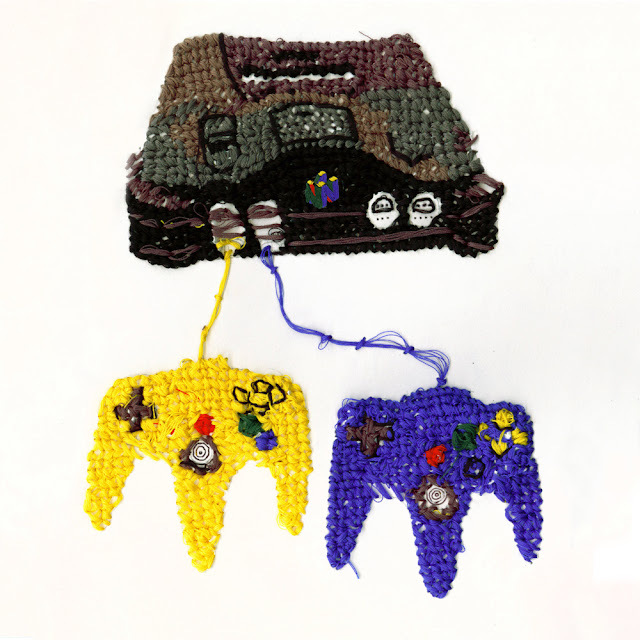 I stitched a N64 for online magazine Peculiar Bliss, under the theme of Pastimes. It took a long time, and it was one of those things where I figured a drawing 'wasn't enough'. The bright colours and seemingly carefree resultant object hides a contrast with the difficult process I embarked upon to try and make something "good enough" to be considered with some sort of regard. They included it in Issue #6, even if it was rather a wooly submission if you ask me. You can see the full magazine here. 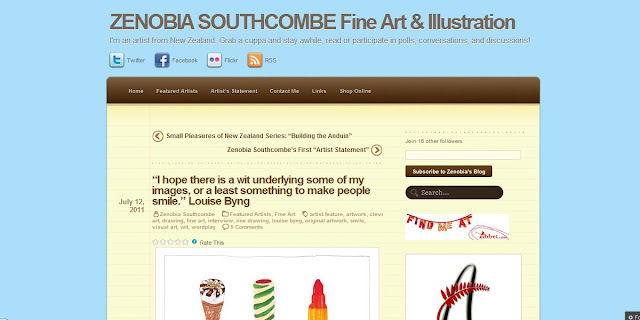 Having got talking to one Zenobia Southcombe on twitter (@ZSouthcombe) with regards to The Sketchbook Project we are both signed up for, she asked me if I would be interested in doing an artist's interview for her blog. I was delighted by the prospect, and said "Why I'd be delighted". So we did it. And here it is: my very own artist's feature. Be sure to check out the other artist's she 'grilled' too, I found them lots of fun to mull over. And at risk of sounding like Beyonce, I feel honoured and a little blessed that she or anyone else cared about my humble responses. She asked some very good questions that made my brain rattle and churn at first and I think I have a perverse taste for answering introspective questions now while trying not to say the word 'I' too much. Just don't ask me Who I Am. We'll be here until January. My original idea for my badge entries was to have one type of bicycle split up into three circular sections, to form three seperate badges. This would mean that if someone was to buy the set of 3 they could compile their own little bike right there on their sweater, otherwise hopefully the elements would be of interest if stood alone. However to exaggerate this, I became more interested in the idea of a hotch potch of different bicycles standing for different characters of riders, all converging up to make up one vehicle. 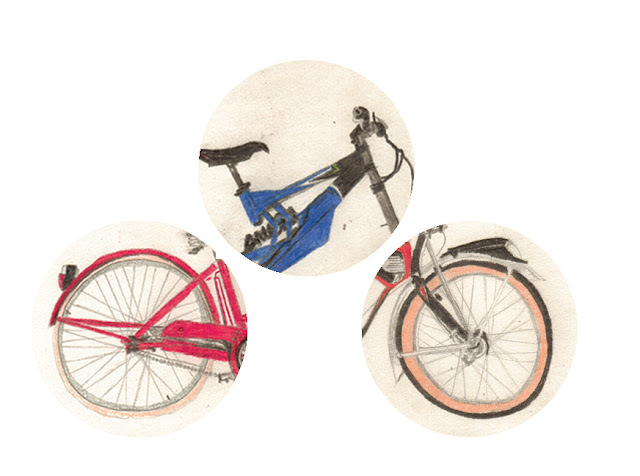 I find the bicycle an intriguing object through the sheer amount of amalgamations it has gone through, and the vast variety of people who use it in their very different daily lives as a result. Invariably slightly disjointed, finishing like a victorian cockentrice of a specimen, I wanted to line up the parts as well as they lent themselves to without becoming forced. I was happy with the outcome, and as ever proud to have got them done on time. I hoped my design would encourage people to play with badges, and think of their clothes as canvases in the morning. ﻿I myself favour using brooches of airbourne objects like airplanes, baloons and birds to turn my garment into a sky. Just submitted them to the competition so let's see if they fly. This morning I finished of my drawings of a Schwinn, a Pashley Britannia and a Mongoose BMX in preparation for my Stereohype badge designs. Favouring different pencils on different occasions, for this set I became enraptured by the smudginess of a 7B pencil, coming out black like charcoal, but in constant need of a sharpen. 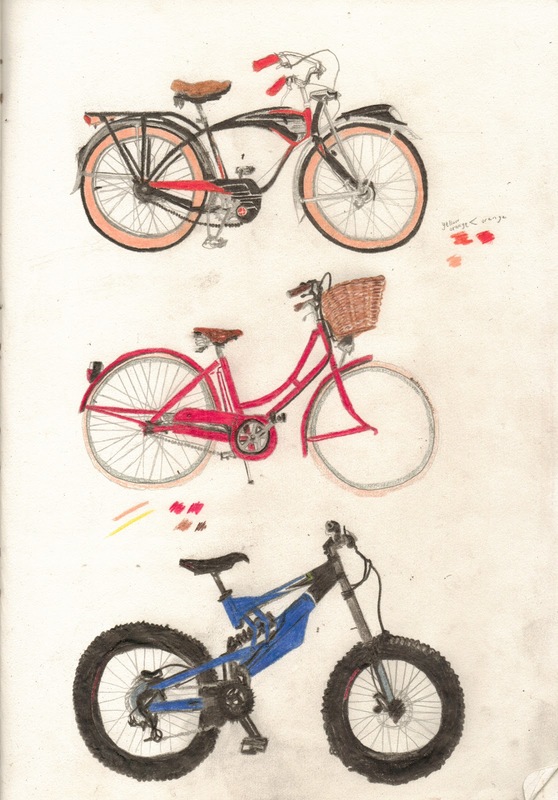 The whole page is a smudgy affair, but I like the fingerprints and the little colour tests surrounding the bikes as a part of the drawing itself. Plus they look happier uneditted, I think. Now to put them in little circles ready to be worn, prospectively.